This was quite the little page turner and definitely worth the bargain basement price of $1.97 that I paid for it at Books-A-Million. Don't go into it thinking you'll be scared out of your mind though because it is a teen/YA book and seems to be watered down accordingly. 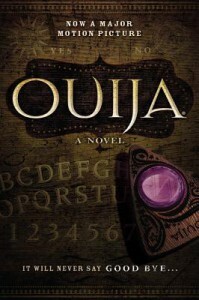 There is some creepiness to it though and it'll make you think twice about playing with a Ouija board. The book was too short though. When I got to the end I was wanting more, more, more! An 'adult' version with a little more depth and horror would be perfect. I definitely could go for that! I'm dying to see the movies now- the original that is based on this book & the prequel that's in theaters. The original movie, I'm planning to watch tonight so I'm looking forward to that. I imagine it will be quite a bit scarier then the book. This is just one of those stories that needs some on screen theatrics. If you like a little bit of paranormal horror but not too much then this is the perfect book! You can get your 'scare me' fix and still sleep at night!